Today is the first day of Autumn and yet I'm doing Christmas!! The letter for the next Craft Barn Alpha Dictionary Challenge is X. There are few words to choose - Xenon is a colourless gas and I don't have a Xylophone stamp so I went with XMAS and added the Christmas definition too! 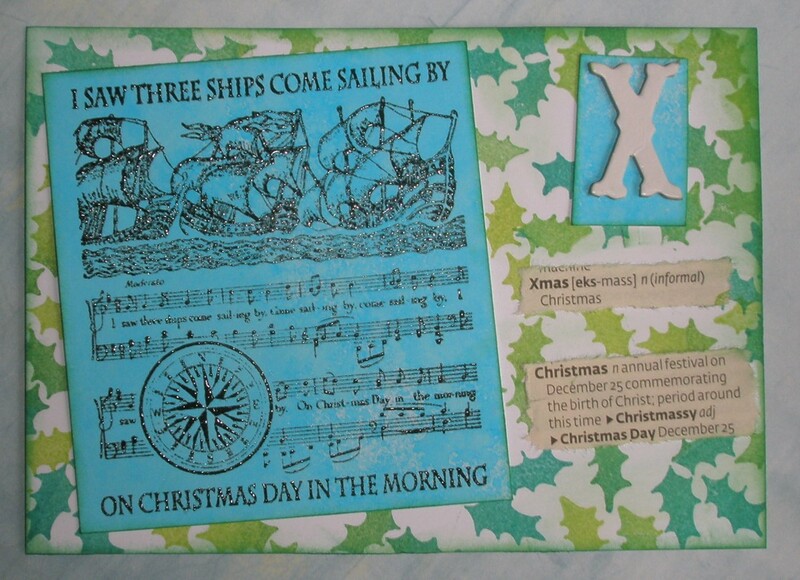 It's really too early for real Christmassy stuff so I decided to use this musical stamp from Crafty Individuals - I saw Three Ships..........please feel free to sing along!! 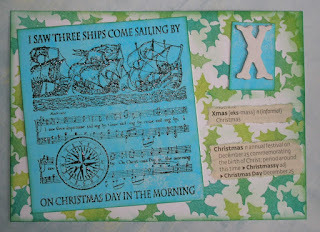 It's just stamped on some inky blue card and mounted on a holly background. As always it's finished with the X Thicker letter and the dictionary definitions. Thanks for coming over to visit.... I'm off to see what everyone else has been making! This is really clever. I laughed because I don't have a Xylophone stamp, either. So glad you and I (and a few others) are still showing the letter along with the definition. I've never seen those thicker letters, but I sure like how you use yours. Yep, I'm singing this song and certainly can't get it out of my head, now! This is a beautiful entry. I've joined in the sing song too! That is a great stamp, I think you can always tell a Crafty Individuals stamp. Perfect entry. Great post and I don't have a xylophone stamp either. I'm trying not to think of Xmas yet, so avoided that one. Great choice of stamp Elaine and it's not too early for Christmas in the shops BTW! I love the colour combinations for this. The X echoes the white between the holly leaves and brings it altogether really well. Love the holly background but the blue musical page is fabulous and perfect for Xmas. You're right it is too early to think of Christmas but unfortunately the stores see it differently. You've made good use of that CI stamp though. I love that stamp and I love the holly background you have made. This is a great Christmas card. Your entry reminded me of childhood and "Listen with Mother". This song was always sung at Christmas. A great postcard with a lovely colour palette.